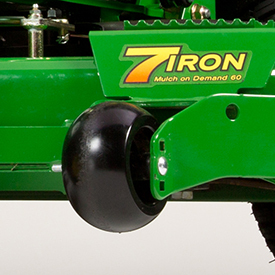 The ZTrak™ M and R Series Mowers are equipped with either a side-discharge or Mulch On Demand™ 7-Iron PRO deck. 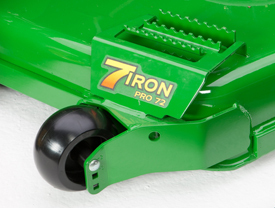 7-Iron PRO mower decks have demonstrated quality, performance, and durability. 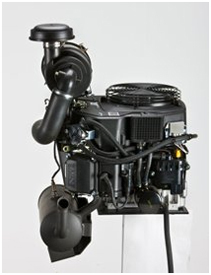 It delivers a high quality cut in diverse conditions. Deck is stamped from 7-gauge, 0.179-in. (4.6-mm) steel to minimize the number of welds and provide a smooth underside, with fewer sharp corners for reduced material buildup. Significantly fewer welds on the deck shell to wear or break- it is stamped from a single sheet of steel rather than multiple fabrications. 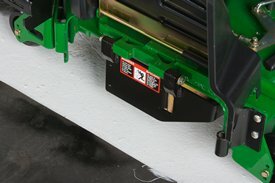 Anti-skid step on the deck provides for easy machine mounting. 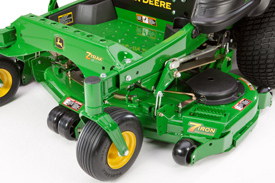 Higher blade tip speed than many competitors - 18,500 fpm (5,639 m/min) for more blade cuts per inch mowed. A deep-deck design of 5.5 in. 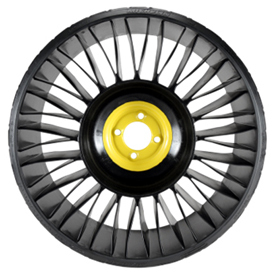 (14 cm) delivers excellent airflow so material can be processed quickly and efficiently. The wider and higher discharge opening provides even clipping dispersal for an excellent finished appearance in all conditions. Deck has rectangular leading deck edge reinforcement and the rounded corners of the stamped deck help distribute impact stress to reduce the potential of damage when the mower contacts trees, rocks, curbs, and other fixed obstacles. Dual-captured front and rear anti-scalp wheels provide deck flotation over even the toughest terrain. Three 1-in. (2.5-cm) cold-forged spindles are heat-treated for strength without bulk and are supported by ball bearings, providing reliability and performance; spindle housings are ribbed cast aluminum providing both excellent strength and heat dissipation. The front edge is raised above the blade plane to allow even cutting of tall grass and reinforced with a square bar for durability. 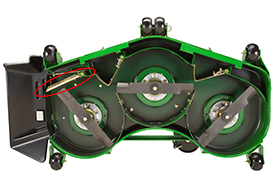 The front baffle has been redesigned to better manage airflow and control clippings. Three spindle grease fittings are accessible from the top. Blade overlap is 1.6 in. (40 mm), nearly 0.79 in. (20 mm) greater than previous decks, to reduce striping between blades. The deck step safely aids the operator's entrance and egress from machine. 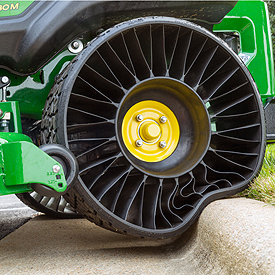 John Deere leads the commercial zero-turn mower industry with use of the Michelin X Tweel Turf technology for the ZTrak Series Mowers. Michelin is a world leader in tire manufacturing and technology. 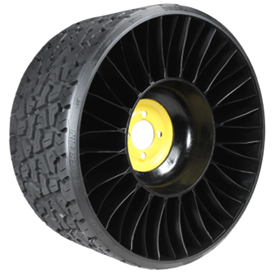 This airless radial tire solution is an industry first for John Deere, which provides an additional advantage to John Deere customers. Reduced rutting because the Michelin X Tweel Turf has more support across the surface for improved flotation and better ground contact. High-strength poly-resin spokes carry the load. Four-hole, heavy-duty steel hub easily bolts onto any 54-in. (137-cm), 60-in. (152-cm), or 72-in. 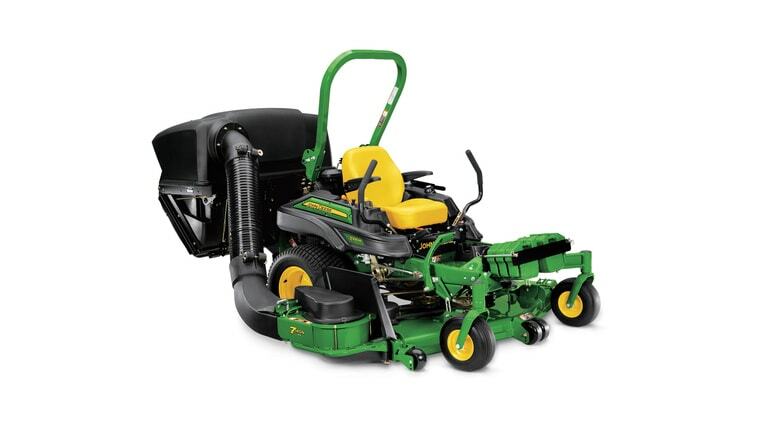 (183-cm) John Deere ZTrak 900 B/M/R Series Mower with 24x12-12 tires. Deep, open-tread design provides excellent cleaning and traction. Zero degree, high-tensile proprietary carcass provides great lateral stiffness while resisting damage from impact and penetration. The Mulch On Demand mower deck delivers unprecedented levels of productivity and versatility to commercial mower operation. 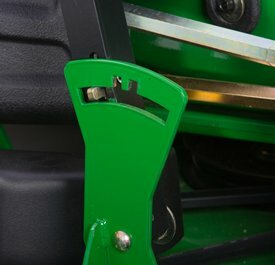 With the ability to switch between side discharge and mulching operation with the flip of a lever as you mow, keeping most clippings out of landscaping features and where they are wanted is extremely easy. Deck can be converted from a wide-open side discharge mode to a fully chambered mulching mode with a single move of a lever. Note: Mulch On Demand decks are a balance between a side discharge deck and a side discharge deck with a mulching kit. Deck is stamped from 7-gauge, 0.179-in. (4.6-mm) steel to minimize the number of welds and provide a smooth underside, with fewer sharp corners, for reduced material buildup. Mulch On Demand decks are superior to aftermarket chute blockers due to the movable baffles. Rounded corners of the stamped deck help distribute impact stress to reduce the potential of damage when the mower contacts trees, rocks, curbs, and other fixed obstacles. Deep-deck design of 5.5 in. (14 cm) delivers excellent airflow so material can be processed quickly and efficiently. Three 1-in. (2.5 cm) cold-forged spindles are heat-treated for strength without bulk and are supported by ball bearings, providing reliability and performance; spindle housings are ribbed cast aluminum providing both excellent strength and heat dissipation. Dual-captured anti-scalp wheels provide deck flotation over even the toughest terrain. Three greasable spindle zerks accessible from the top. There are three seating options available on the M and R Series. The deluxe comfort seat from the Z900A Series is standard on all Z900 Series models. 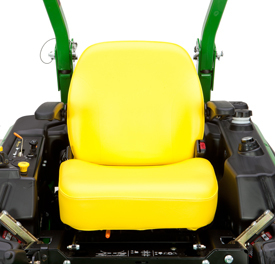 In addition, there is now an isolation seat option that is available on the M and R Series which reduces vibration and increases operator comfort. A full suspension seat is also offered. The full suspension seat also offers adjustable back angle as well as adjustable lumbar support. All seats are factory installed. Standard and isolated seats have rubber springs to increase ride comfort. 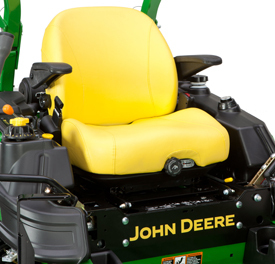 A convenient seat latch makes it easy to lift the seat. 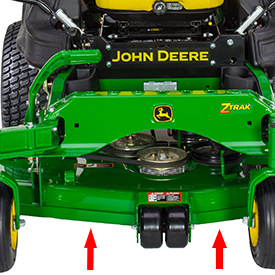 On every John Deere ZTrak mower deck there are three 1-in. (2.5-cm) spindles that are cold-forged and heat-treated for strength without bulk. The spindles are supported by precision ball bearings, providing great performance and reliability. The spindle housing is made of aircraft-grade ribbed cast aluminum. This unique casting design embosses reinforcing gussets in the housing, which adds both strength and cooling surface area that stands up to commercial applications. These spindles can be greased from the top and require no disassembly to reach. Grease channels provide lubrication to both bearings. The hydrostatic drive features two 13-cc unitized hydraulic pumps combined with commercial-grade, heavy-duty wheel motors into a single unit. 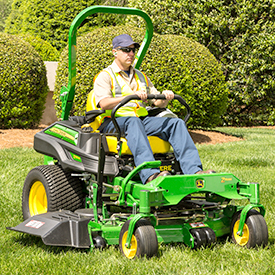 An exclusive two-year/unlimited hour, three-year/1200-hr (whichever comes first) bumper-to-bumper warranty is standard for all John Deere B and M Series Mowers. 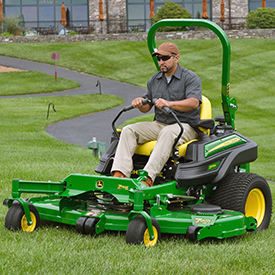 The warranty is best in class and places John Deere at the forefront of commercial mowing. It is also hassle free, with one company handling all of the paperwork. 36 months or 1200 hr, whichever comes first. First 24 months, no hour limitation. 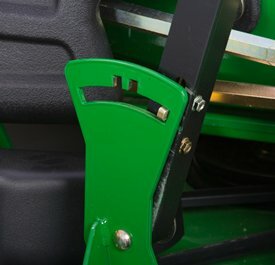 An exclusive two-year/unlimited hour, three-year/1500-hr (whichever comes first) bumper-to-bumper warranty is standard on all John Deere R Series mowers. 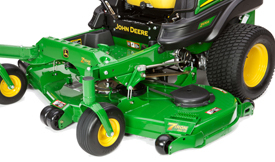 The warranty is best in the industry and puts John Deere at the forefront of commercial mowing. It is also hassle free, with one company handling all of the paperwork. 36 months or 1500 hr, whichever comes first. First 24 months, no hour limitation. Width With chute down, 74 in.